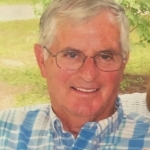 Ronald Lyle McCall, age 85, lifelong resident of Waterford, died Friday, April 12, 2019 at Edinboro Manor after a long illness. Born in Belle Valley on November 4, 1933, he was one of five children of the late Wallace and Dorothy Davis McCall. He married Amber Owens on August 22, 1953 who preceded him in death on July 7, 2014. A loving husband and a great father and grandfather (“Poppy”); honest and hardworking with a good sense of humor — this is how Ron will be remembered by his family. He enjoyed playing cards, bowling, square dancing, golfing, woodworking, and spending time with his family. In high school he was a standout athlete in basketball and football, and he was nicknamed the “fleet-footed flash.” Following high school, Ron served in the U.S. Army. Ron retired in 1998 as a salesman at Humes after more than ten years of service. He was an active member of Asbury United Methodist Church and was involved in various committees, projects, and mission trips. Surviving family members include: four children, Dawn Casey and husband, John of Poland, Ohio, April White and husband, Gary of Waterford, Julie See and husband, Ed of Titusville, and Jay McCall and wife, Heather of Summit Township; eight grandchildren, Jillian (Taylor Lovejoy), Katie (Jason Dibell), Amber, Andrew (Staci), Abby (Todd Dingle), Katelyn, Joshua, and Julia; two great grandchildren, Harley and Teresa; two siblings, Twila Hare of Corona Del Mar, CA and Michael McCall (Linda) of Waterford, sister-in-law June McCall of Waterford; and many nieces and nephews. Ron also had two brothers who preceded him in death, Wallace Jr. and Marshall. Visiting hours will be at Van Matre Funeral Home, 105 Walnut Street, Waterford on Thursday from 2-4 and 6-8 p.m. The funeral service will take place at Asbury United Methodist Church, West 2nd Street, Waterford on Friday, April 19 at 11:00 a.m. with Rev. Gary Donaldson officiating. Burial will follow at Waterford Cemetery. The McCall family would like to express thanks to the caregivers at Edinboro Manor for their loving care, and to family and friends for all their support during this difficult journey. Memorial gifts may be made to Asbury United Methodist Church. Prayers to all Ron was a special man at the manor.Thank you for allowing us to be a small part of his life. It’s with a heavy heart that I send you my condolences on the passing of your Dad. I know he fought a good fight these past few years since your Mom’s passing but he’s with her now. They will have Good Friday together in Heaven. May God Bless you all and He will. God will be right by your side throughout this sad time and give you the comfort and strength you need. I’m praying for you all at this time.